Our mobiles have become the only thing we go out or do anything without, as their importance increases day by day, and their uses have become wider and wider. For that, in some cases such as in case of emergency, they would be our only hope to ask for help. Things like car crashing, kidnapping, getting lost, losing our pocket money … etc. All of these situations could be solved using our mobiles. Don’t know how? Let me explain how your mobile could be a live saver in the upcoming lines. Companies that manufacture our phones or systems like Samsung, Huawei, and Google give a lot of attention to the productivity and entertainment functions on the mobile. They added sticky notes, Google Drive, calendar, supported a huge number of games, and office applications. Above all of that, our health and safety have become important elements, and for that, they provided applications like Samsung Health and Emergency which is the topic of our today’s article. Using emergency contact information on your Android phone would help you call someone for help when you are in case of urgency, reach someone quickly before the battery drains, or contact someone as fast as possible so that he can help you out. 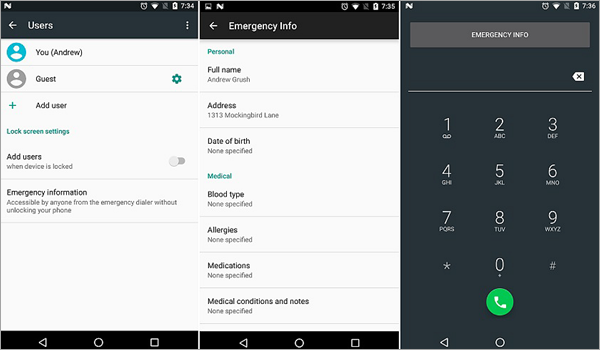 You can do all of that by inputting the right information on your Android phone’s emergency; such as adding an emergency contact list, details about your blood type, address, or medical notes that contains the actions should be taken in some specific situations in which you cannot talk. 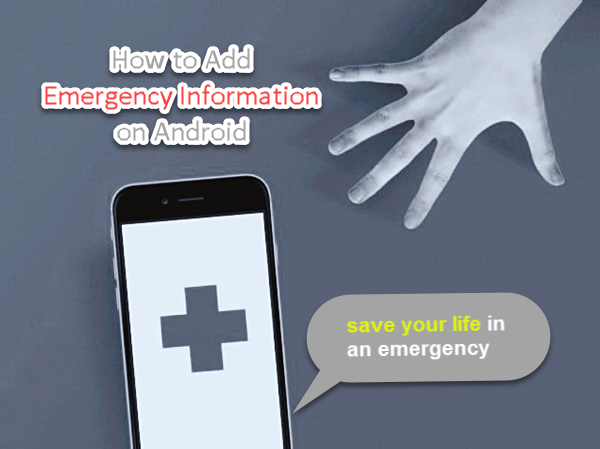 There are some easy ways to add your emergency information on Android to save you in case of emergency. Some of these ways are only available for specific devices like the SOS feature on Samsung phones, and others are available for any Android operating phone. In the few upcoming lines, I will explain the best and easiest methods you can follow in order to add emergency information into your phone, in order to have a live saver in your pocket. 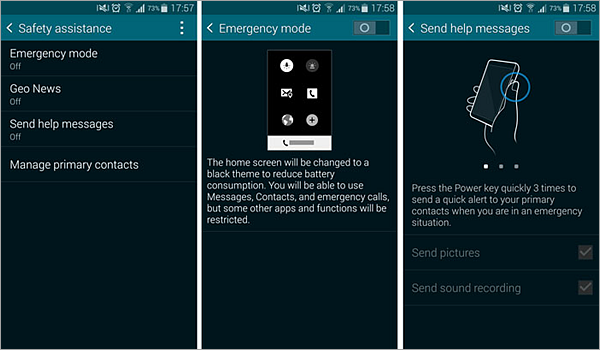 The methods will be divided into three types; The first will be using the built-in emergency features, the second will be using Emergency Mode provided by Samsung for Samsung phones’ users, and the last will be a selection of three third-party in case of emergency apps that can be used to provide emergency contact information on Android lock screen. The first method we will talk about is adding our emergency information using the built-in features which is available on any Android phone. First: Head to “Settings”, and click on “Users”. Second: Click on “Emergency Information” and tap “Continue” that will show up. By reaching this, you will be able to add your emergency information, which includes your name, address, blood type, allergies, medications, and organ donors. This information will help anyone who finds you to identify your identity, your address, your blood type, and others without having to have an access to your phone. This will allow him to give you’re the appropriated hand you need in many situations like being lost in the road, having an accident and need for blood, taking a specific set of actions when you have a coma … etc. The other tap-Contacts-will allow you to add your emergency contact list, the one you can call without the need to access your phone, in addition to allowing other people to reach one of your family member of friends easily in case they found you in a trouble. You can add the contact you need by clicking on “Contacts”, and then click on “+Add Contacts”. This method is available for almost all phones that running the Android operating system. In the next paragraph, I will focus on the Samsung mobile phone and its SOS features. Samsung as usual tries to compete the stock Android features by providing its users with competitive features. In the field of emergency, they added a function called SOS. This function will allow you to send a snap of you, your location, a message calls for help, and an ambient sound recording for five seconds that will notify the receiver that you are in need for his help. This function was introduced for the first time on Samsung Galaxy S6, and it continued its existence on all next Samsung phones after that. First: Head to the “Settings”, then click on “Advanced Features” or “Privacy and Safety” on some Samsung phones. Second: Toggle the “Off” button to enable SOS messages. Third: Check the box which indicates that you have read the terms and conditions and click on “Agree”. Fourth: A window will pop-up telling you that you have to add at least one contact to enable SOS messages, click “Add”. Fifth: Select whether you want to create contact or select from contacts. Sixth: After adding from one to four contacts, go back and make sure that you have checked all the boxes. Now, you have set up your SOS messages, in order to use it, press the power key quickly 3 times, nothing easier. Fortunately, developers haven’t forgotten about creating emergency apps with more functions and to be available even for those who don’t have built-in emergency functions on their phones. I have selected the best three emergency apps on the Play Store, and I will briefly explain each of them in the following lines. This application is available for Android Lollipop and above. It will always be visible on your lock screen, containing your emergency information. 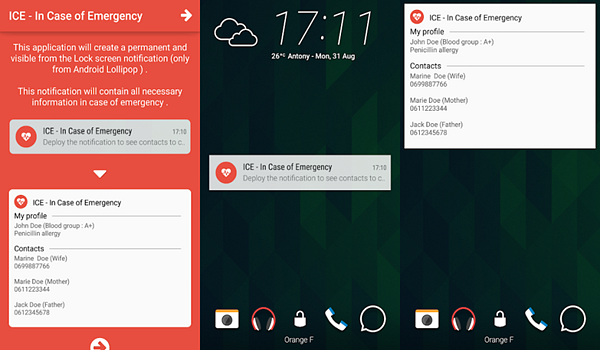 After downloading and installing ICE – In Case of Emergency, the first thing you will need to do is to enable it by toggling the button in the upper-right corner of the screen. After that, you can add information about yourself in “My Profile” section such as your name, your blood type, and others. Also, you can add some contacts that will be called in case of emergency in “Contacts” section by clicking on the blue + icon on the lower-right corner of the screen. You can download the application via the Play Store, and it’s totally free. 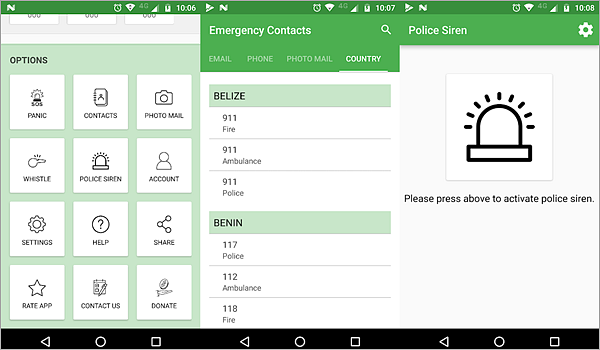 SOS Emergency App is a great app with a pretty and easy-to-use interface, it allows you more options than the built-in features and even SOS feature of Samsung phones. You can add your name, address, and emergency contact list. Also, it provides you with the phone number of the police and the phone number of the ambulance in your country. It also allows you to send a snap of you to pre-filled email addresses, and it has a whistling voice used to get attention in case you feel that you are going to fall down. You can download the SOS Emergency App for free via the Play Store, and there are some videos that explain how to use it well provided in the application description on the store. This app is specialized in providing your medical information for the people who found you in trouble. It allows you to create a full medical profile including your blood type, allergies, medical contacts, and other medical-related information. All this information will be showed up in your lock screen, which will allow people to know more about you and how to deal with your situation. 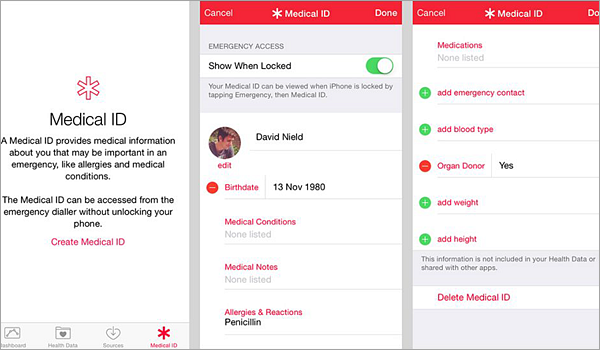 Besides, it will give you the ability to send alert messages to your medical contacts with a touch. The app is available for free on the Play Store, and you can upgrade to the premium version of it to get more features. In addition to some emergencies in our lives we may also encounter some rather tricky or overwhelming problems, such as accidentally deleting our favorite photos, important contacts or vital text messages, or even restoring the phone to factory settings without backing up it. Then, this will be a huge loss for us. In this case, is there any way to save our lost data? The answer is Yes! In fact, you only need to download and install a professional Android data recovery software on your computer in advance. If data loss occurs on your phone, you can connect your phone to the computer and let the program quickly scan and retrieve lost data from your Android phone, then all the lost or deleted data will be recovered in few minutes. Your health and safety are one of the major things that we, the developers, the phones manufacturers care about. The provided methods above would waste 2 minutes of your time, but believe me, it will not be wasted for nothing, as it could save your life, save a family member’s life, or save a friend’s life if you shared this article with him. Don’t think too much, start following any of the previous methods, share it, and make the others’ lives more safe with a button click. Easy-to-use data recovery tool for Android devices to recover lost files from Samsung, HTC, LG, Motorola etc.